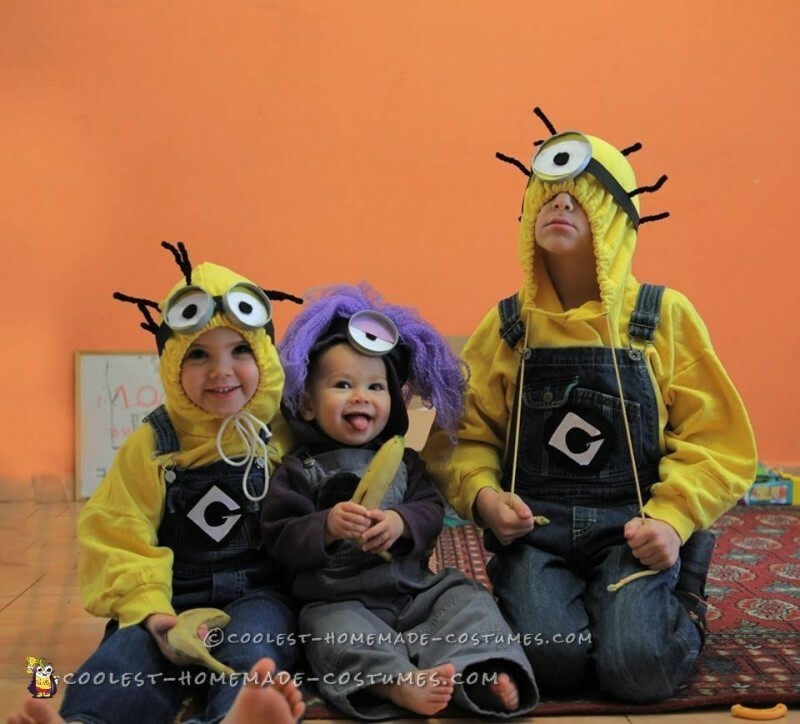 Ever since we saw the movie Despicable Me 2, I wanted to dress up as the characters as a family. 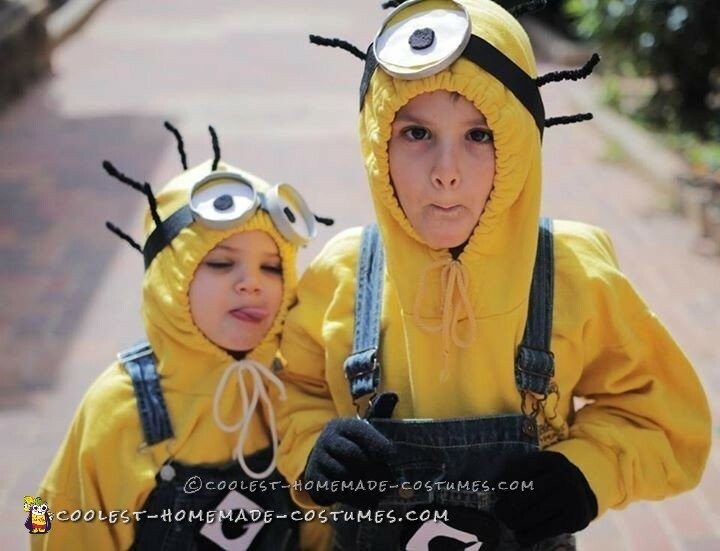 Not only because it’s a great movie but my kids are, seriously, minions. And my youngest daughter, Keren, is totally the evil minion. For a few months she started growling- it was so funny – and the kids said she sounded like the purple minion. So I got started making the costumes. 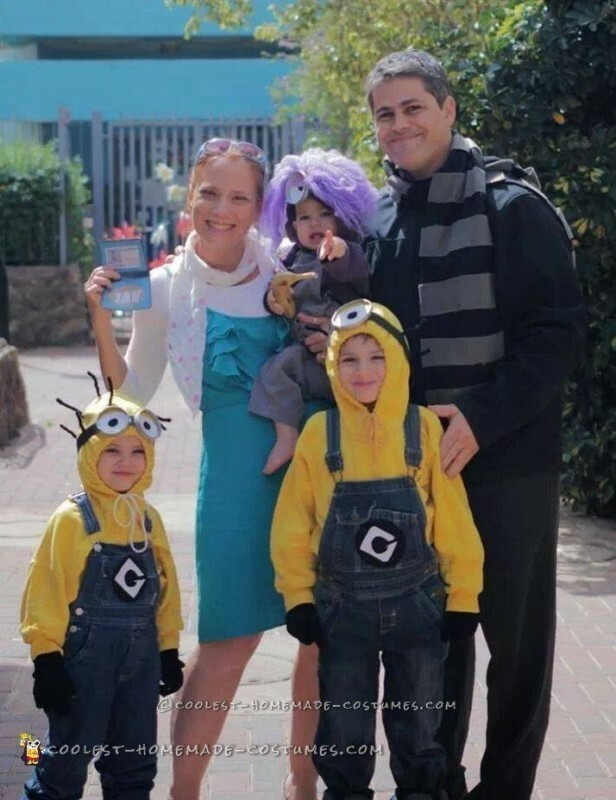 Gru – We tried getting a bald cap but it didn’t really work and I wasn’t going to spend $25.00 on something my husband would wear once, so we scrapped that idea. Eli wore black pants and a tee-shirt and happened to have a black jacket that looked just like the one in the movie. For the scarf – I actually made it. Again, I didn’t want to spend $15 on the actual scarf. I went to the second hand store and found one grey and one black fleece scarves and I literally cut up the grey scarf into thick strips and hot glued it onto the black scarf – done and done. Lucy Wilde – it worked out nicely that I happen to have red hair! 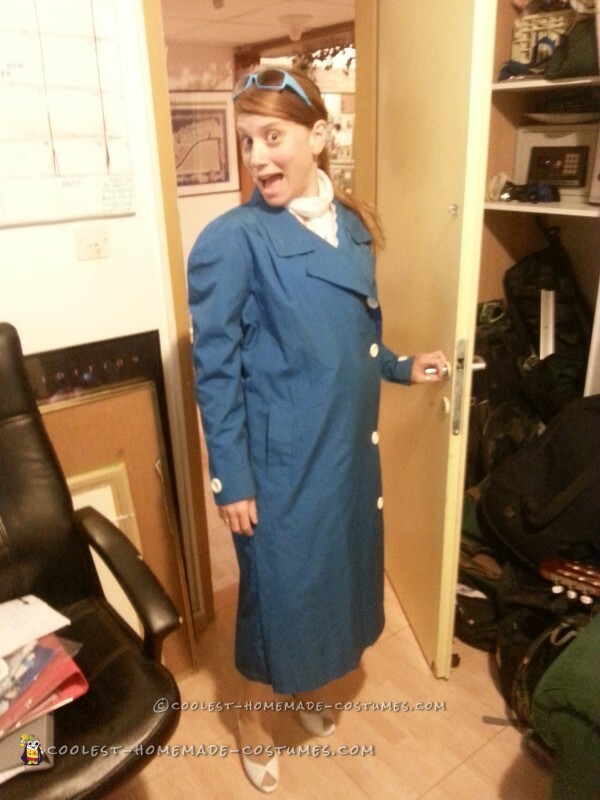 I found this long blue trench coat at the second hand store that was a size 4x (which is massive for me!). this was the only thing I actually “spent” money on – I gave it to my friend who is a seamstress and she took it in for me and made it fit (I paid her about $15 for her time). I then found big white buttons at the second hand store and glued them on to the coat. I found a short blue dress and took an old pair of sunglasses and painted them blue using acrylic paint. I made Lucy’s scarf using a white scarf I found at the second hand store that I cut up to fit the size I needed. I embellished it with pink circle stickers that I got glued onto the scarf so they would stay in place. You cant see it in the picture but I went all out and wore white high heeled shoes like Lucy wears – I bought a pair old black high heeled shoes from the second hand store and spray painted them white. I never wear heels so I basically wore them only for the pictures (which of course is not in the picture!) and then wore my Uggs the rest of the time. No one seemed to notice the difference really. I made Lucy’s picture ID from an online printable and used my ID card (which happens to be the exact blue I needed – go figure). After all that, I didn’t even wear the coat, it was too hot. But it was awesome anyways. 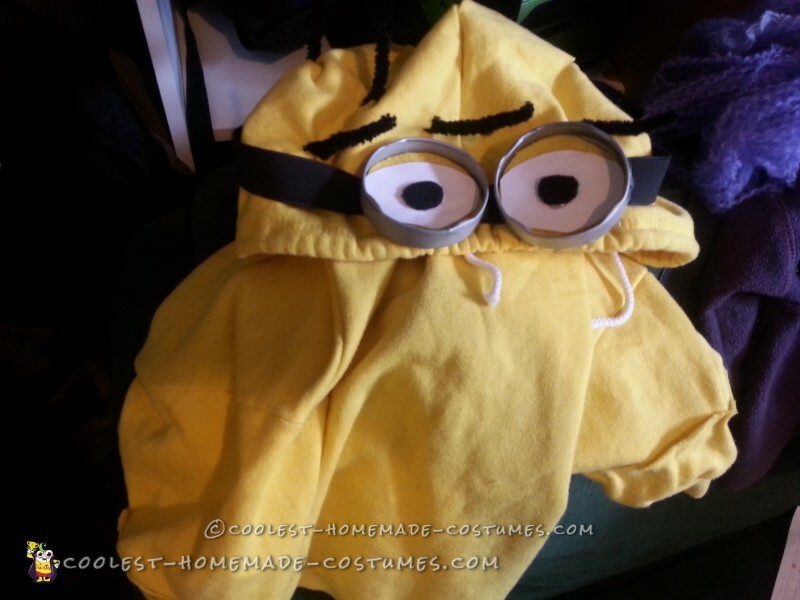 Minions – I already had a pair of overalls for my son so I took them with me to the second hand store to find a pair for my daughter (Hallel) that was the same color. After looking everywhere I couldn’t find yellow hoodie sweatshirts – and I was not prepared to pay $20 per hoodie so I went looking at the second hand store. I found two yellow hoodies that were the exact color I needed but they were size M and L adult and I needed for a four and seven year old, so I bought the big hoodies and literally cut the bottom part off that was too big AND I cut the sleeves so that they would fit my kids. For the sleeves, I cut the cuffs off, cut off a big portion of the sleeve to fit my kids and then re-glued (hot glue, baby!) the cuffs onto the shortened shirt so they now fit. The hoodies I found also had stuff written on it but it didn’t matter because they were covered up by the overalls. The hair was made using thick pipe cleaners. I snipped two teeny holes through the top of the hood, threaded the pipe cleaner through it and tied it and make it stick up. I put a whole bunch of these on the head until I was happy with it. 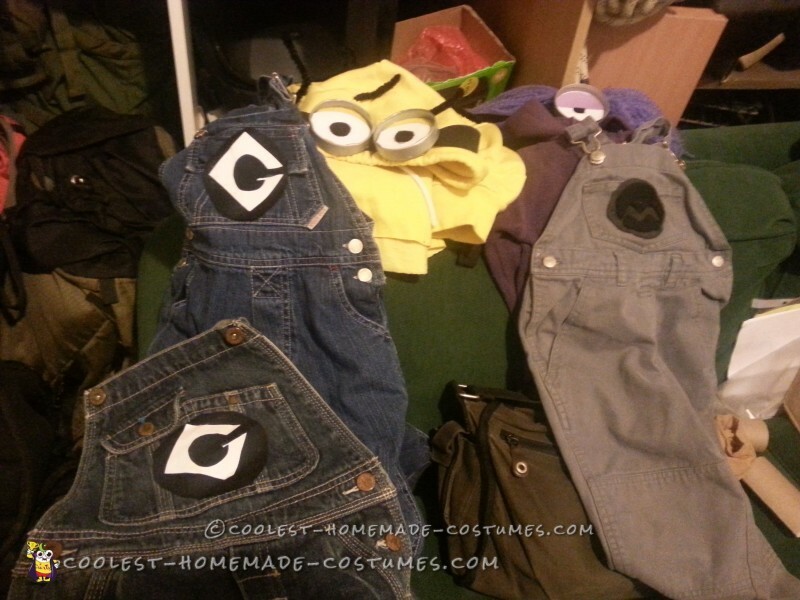 The GRU symbol was made with foam paper and I pinned it to my sons overalls so we could reuse the overalls afterwards and glued it to my daughters overalls (they were 25 cents). 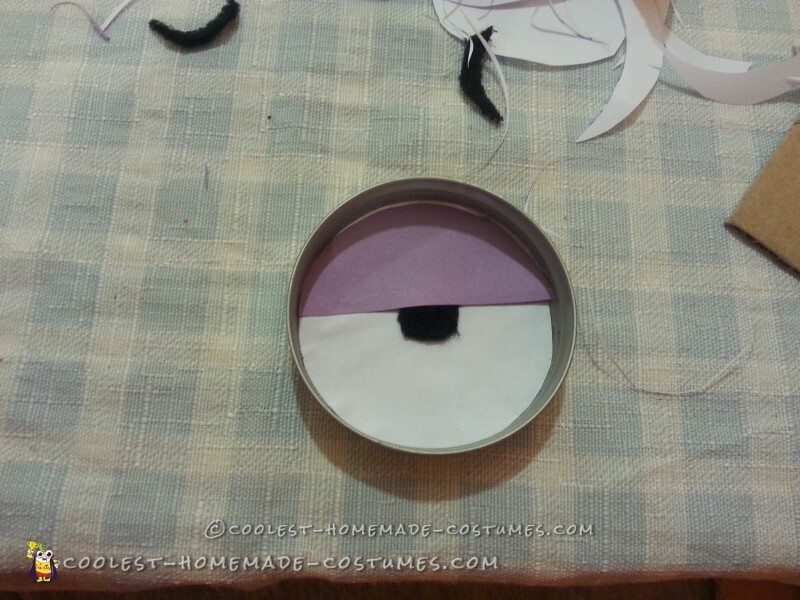 The eyes were made out of jar lids, white paper and foam paper. 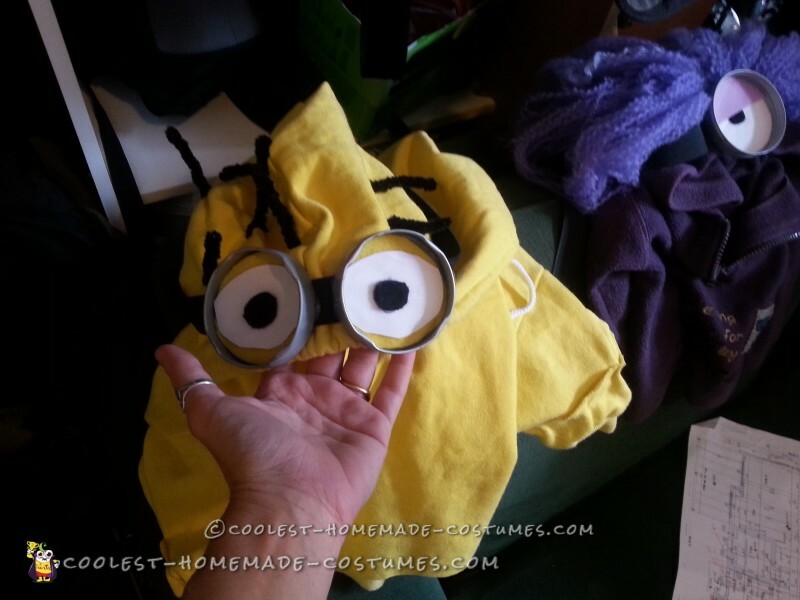 I used black elastic and measured each one around my kids heads before cutting it – make sure you leave a little room – I then glued one side of the elastic behind one of the “eyes” and then hot glued that on to the front of the hoodie. I then took the elastic, wrapped it around the hood and glued it to the other side. This way it looks like it’s connected, but its really not, its not too tight and the hood stays on. It was awesome. I bought cheap black stretchy gloves for the kids and they were set! 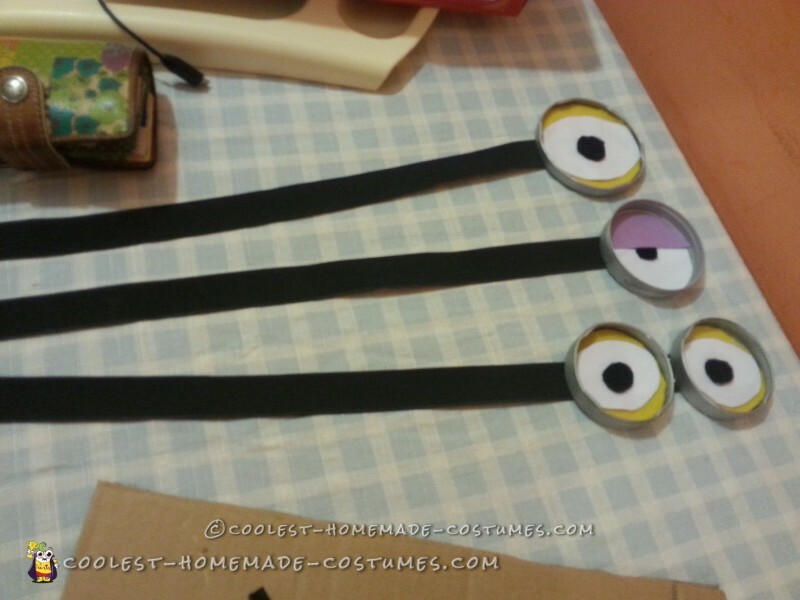 The Purple Evil Minion – okay, this was a lot harder – but seriously you need time to make this one. This was made pretty much like the regular minions with slight differences. 1) You need grey overalls. 2) You need a purple hoodie and 3) You need purple crazy hair. I borrowed a pair of grey overalls from a friend and found a purple hoodie at the second hand store and went to work with the hair. I got purple yarn and went all wacko on this, please don’t judge me. In order to make the hair correctly, I would cut a piece of string, separate the yarn, brush it out and set it aside. I must have worked four hours or so making enough “hair”. I then hot glued it onto the hood of the purple hoodie. A couple of things to remember – first – even with working an insane amount of time, I found I didn’t have enough hair – you don’t have to cover the whole hood and I took yarn, shmushed it up and shoved it inside on the bottom of the hood around the other hair to give it more volume. I also glued yarn to the back to give it volume as well. I really made that one up as I made it and when I added the “eye” and the strap around it, it also helped keep the hair up. Keep in mind that the eye on the purple minion is different as well. 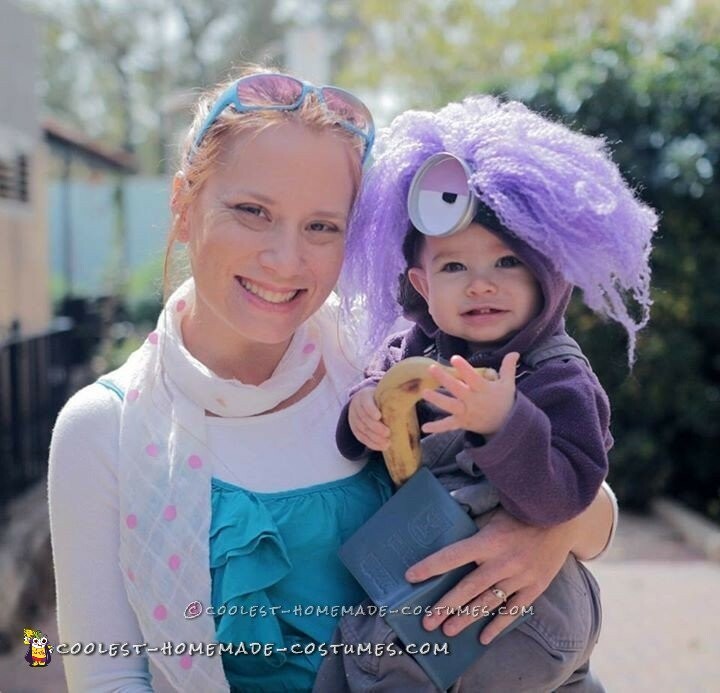 It came out so awesome, the purple minion came out so awesome and my daughter didn’t pull the hood off either! I gave everyone bananas, and we were ready to go! EVERYONE loved our costumes, it was a huge hit!